It’s not a new concept that our health has much to do with our diet, and it’s not surprising to find that the same is true with our pets. Over recent years, eliminating gluten, a protein found in wheat, barley, and rye, from the diet has grown increasingly popular. Gluten has now been shown to cause health problems not only in humans but in our pets as well, and for this reason, many pet-owners have made the switch to gluten-free pet food. 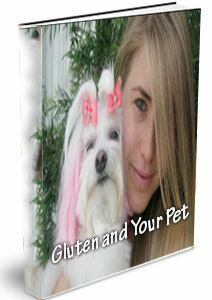 This informative eBook will help guide you through what you need to know to get your pet on a healthy diet with results that both of you will love. Click on the PayPal link below to order this e-book by Miranda Jade Turbin. Cost is only $4.95.